Saturday was a weird sports day, just ask college football fans. But, the NBA was not without some drama of its own as the Cavaliers won their second straight game over a possible conference finalist, while the Mavericks had the Celtics frustrated and the Wizards bounced back from an abysmal shooting performance. First, in Cleveland, the Cavaliers dropped the Rockets 117-108 just one night after handing the 76ers their first home loss of the season. Tristan Thompson was especially good as he scored 16 points and grabbed 20 rebounds. 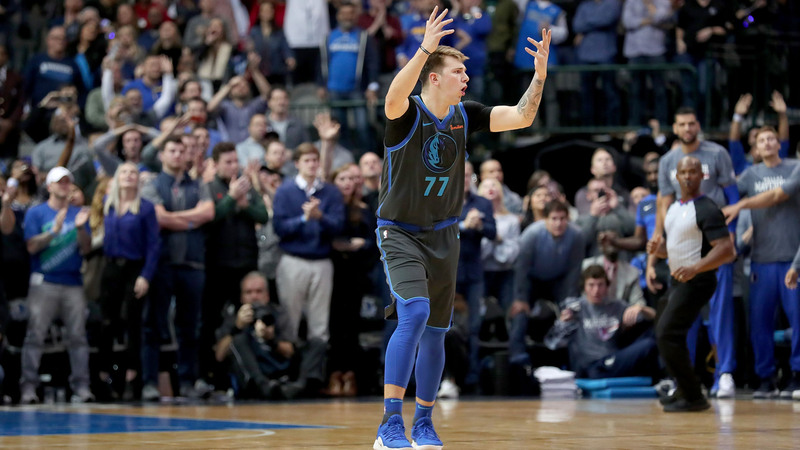 In Dallas, the Mavericks took down the Celtics 113-104 and Luka Doncic got Boston so frustrated at one point, Jaylen Brown gave the rookie a shoulder after a fast-break assist. Finally, one night after missing 37 3-pointers against the Raptors, the Wizards defeated the Pelicans 124-114. Otto Porter Jr. scored 29 points and added seven rebounds one night after going 1 of 6 from 3-point range. It was a weird night for sure, and it was almost weirder as the Kings were just five seconds away from upsetting the Warriors. Fortunately for Golden State, Klay Thompson came to the rescue with a layup in the closing seconds. Speaking of Thompson, the Warriors guard scored 31 points in a 117-116 win over the Kings, but it was Kevin Durant who tallied a season-high 44 to go with 13 rebounds and seven assists. Timberwolves center Karl-Anthony Towns was simply ridiculous Saturday going 13 of 23 from the floor with 35 points and 22 rebounds in a 111-96 win over the Bulls. Giannis Antetokounmpo was just as good for the Bucks as he scored 34 points while grabbing 18 rebounds and eight assists in the their 135-129 win over the Spurs. Russell Westbrook tallied his second double-double of the year with 16 points, 12 assists and 10 rebounds, but he nearly matched Bucks center Brook Lopez’s performance from Friday as he went 1 of 12 from 3-point range. Lopez set an NBA record by going 0 for 12 in a loss Friday. Timberwolves forward Andrew Wiggins was infinitely worse than Westbrook though as he scored zero points on 0-of-12 shooting with just one assist in 29 minutes. Giannis Antetokounmpo is usually the one dunking on people, but he got dunked on by DeMar DeRozan on Saturday. DeRozan had 34 points in the loss. Clippers (12-6) at Blazers (12-7) 9 p.m. ET — The surprising Clippers, who currently hold down the second seed in the West, will take on the Blazers in a matchup of potential playoff teams. Both squads need some help going forward if they really want to compete in the postseason, but they are playing well now.